Your liver is the major fat-burning organ in your body. It is your furnace and energy factory. It is the mechanical filter and cleanser of your blood. In fact, it is the organ of your longevity. Think of it this way: Take away the letter “R” at the end of liver and what do you have? Live. How long you want to live and how well you want to live has a lot to do with your liver. The liver is designed to remove and filter out dead cells, toxins, microorganisms, and even cancer cells from the bloodstream. So if you are not feeling energetic and full of life, chances are that it has got something to do with your liver. Toward the end of the 1900s, there has been an emerging epidemic of liver disease that is quite startling. You see, in earlier days, liver disease used to be mostly confined to alcoholics, but we are now seeing this new phenomenon of people with fatty liver, people with hepatitis, people with toxic overload, people with a lot of immune disease that is associated with liver dysfunction. Even if they do not consume alcohol. Clearly, this is a result of the modern world we live in where our bodies are attacked by toxins from every conceivable angle. The toxins are everywhere — in the food we eat, the water we drink, the air we breathe, even the clothes we wear. And our liver is bearing the brunt of all this toxic overload. When the liver is taxed, it cannot process toxins and fats in an efficient way. As we cannot (practically) change the way we live, we should cleanse our liver naturally once in a while (maybe every year) and make sure to do everything to either decrease the toxins, or counter the effects of all the toxins. And the best way to do that is naturally. By consuming healthy liver foods in our diet. Garlic: This pungent bulb is my favorite all-time liver health food. Not only does it have great liver health benefits, it is very versatile and adds so much flavor to different recipes. Garlic is rich in a variety of powerful sulfur-containing compounds, which are responsible for garlic’s characteristically pungent odor and are also the source of many of its health-promoting effects. Sulfur is required to increase enzyme activity that boosts liver cleansing. Without adequate levels of sulfur, many toxins can become more dangerous in your body. Research findings suggest garlic to be effective in supporting serum cholesterol and low-density lipoprotein cholesterol in individuals with elevated total cholesterol levels. Because high total cholesterol and low-density lipoprotein cholesterol are associated with poor liver health, regular garlic consumption could help keep your liver healthy. Hepatology experts agree that anyone concerned with their liver’s health are served well by cooking with lots of garlic. Besides keeping vampires away, consuming several cloves of garlic a day may reduce your risk of normal liver damage and even liver damage from oxidation. 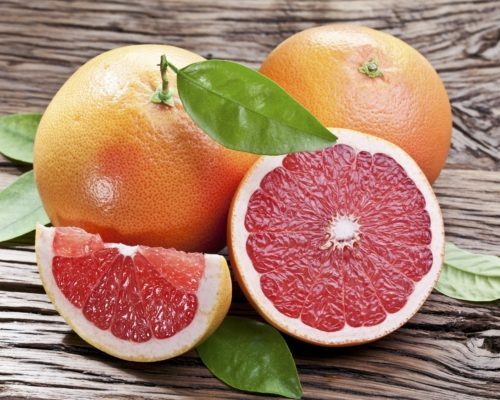 Grapefruit: This health fruit is rich in vitamin C, potassium, and antioxidants. It is also a good source of pectin, a form of soluble fiber that has been shown to slow down the progression of atherosclerosis. Grapefruit can reduce blood levels of LDL (“bad”) cholesterol, and red grapefruit lowers triglycerides as well. Grapefruit increases the natural cleansing processes of the liver. A small glass of freshly squeezed grapefruit juice will help boost production of the liver detoxification enzymes that help flush out many toxins. However, grapefruit juice should be taken with caution as it can interact dangerously with many medications. Grapefruit inhibits enzymes in your liver responsible for metabolizing certain drugs. This can affect the way your medicines work and have dangerous results. If you are on prescribed medicines, please consult your doctor before eating grapefruit or drinking grapefruit juice. Leafy green vegetables: Green vegetables like spinach, kale, and broccoli are powerful allies in cleansing the liver. If you are concerned with your liver function, your diet should be rich in fresh green leafy vegetables that are rich in chlorophyll. Chlorophyll can protect you from toxins like no other food or medicine. With its ability to neutralize heavy metals, chemicals, and pesticides, chlorophyll offers a powerful protective mechanism for the liver. It strengthens your cells, detoxifies liver and bloodstream, and chemically neutralizes the polluting elements. What’s more, chlorophyll adds oxygen into the blood that is essential for optimal liver function and rejuvenation. Greens also help increase the production of bile, which is extremely important for fat metabolism and detoxification. The good thing about leafy greens is, they are available everywhere throughout the year and can be eaten raw, juiced, or cooked. Avocados: Many nutritionists call avocado the perfect food for its nutrient-rich content. Avocados provide nearly 20 essential nutrients, including fiber, omega-3 fatty acids, vitamins A, C, D, E, K, and the B vitamins (thiamine, riboflavin, niacin, pantothenic acid, biotin, vitamin B-6, vitamin B-12, and folate) as well as potassium, all of which help neutralize free radicals. The icing on the cake is the fact that avocados are sodium free and cholesterol free. Apples: An apple a day can definitely keep the liver surgeon away. Apples are high in pectin and other chemicals essential to cleanse and release toxins from the digestive tract. Apples make it easier for the liver to handle the toxic load during the cleansing process. Brussels sprouts: Like garlic, Brussels sprouts are high in sulfur content. They are also a rich source of the antioxidant glucosinolate, which forces the liver to release enzymes that prevent and even undo the damage from environmental or dietary toxins. And guess what? Brussel sprouts combine extremely well with garlic and a dash of sea salt to make a simple yet delicious recipe. Along with making these foods a part of your daily diet, there are a few tips to follow to ensure that you are lessening the load on your liver. For starters, make sure you wash all you vegetables and fruit thoroughly to remove any residual chemical from them. As much as possible go for organic fruits and veggies that are locally grown. This way you can ensure their freshness. As with any healthy eating practice, stay away from artificial sugars (including high-fructose corn syrup) and sweeteners. Even too much salt is a no-no. For seasoning food, try different natural herbs and taste enhancers like lime, lemon, and berries. And yes, keep that alcohol away. It is your liver’s biggest enemy. Avoid all antibiotic and chemical-fed meat – these are high on the list of foods that harm the liver. If you must eat meat, stick to pastured chicken and pastured beef, and wild-caught fish. And as much as possible, avoid processed food, artificial food additives, colors, and preservatives to give your liver a break. Fruits are essential to any diet, as they provide us with antioxidants, vitamins, and other nutrients. But even some fruit can pose a threat to our liver. All fruit comes with some level of sugar commonly referred to as fructose. Such items high in fructose are raisins, fruit juices (mind your morning OJ) and honey (not a fruit, but a type of sugar). In research published in Hepatology, fructose was linked to a fatty liver, as well as inflammation. Besides fruits, fructose can also be found in many processed foods and beverages, such as soda, fruit snacks, even bread and crackers. With fructose being such a commonly used ingredient, it’s easier to ingest high quantities of it, so read the food labels when you’re shopping. Research published in the American Journal of Clinical Nutrition reported high-fructose corn syrup is found in soda and is made up of 55 percent fructose. They noted that all that fructose was not only harmful by increasing obesity, but it can lead to liver damage. The next time you’re thirsty, you may want to avoid the juices and the soft drinks and opt for some water. Better yet, add some fresh lemon to really get some liver-detoxing benefits. If you find yourself stopping by those golden arches quite often throughout the week, it can be causing your liver some despair. Fast food is generally not good for our health, but especially so for our livers. Fast food increases your risk for obesity and also raises cholesterol, which is bad for your liver and heart alike. Trans fats are also lurking in your French fries and donuts. A 2013 study, published in Hepatology, found that trans fat increases fat within the liver. So although these meals are quick, they will leave a lasting impression on your liver. The goods news, though? Research has shown that the effects of fast food on the liver can be reversed by cutting down or eliminating these types of food. So it’s not too late to switch up your diet now and start working on a leaner liver. If you are over 50, take a high quality multivitamin and mineral supplement to avoid any deficiencies. After all, when it comes to your liver, it’s best not to take chances.